With just over a month until the spectacular Longines Global Champions Tour of London kicks off at the Royal Hospital Chelsea, an exclusive film featuring British Olympic Gold Medallists Ben Maher and Scott Brash, can be revealed. Click HERE to watch the full film. With the top show jumpers in the world descending on the heart of London, this is a premium sporting and social event you simply won't want to miss this summer, with something for all the family to enjoy. Tickets are still available, so book now via Ticketmaster to save your seat in the grandstand, with thrilling action on the cards from the best horses and riders on the planet. 2017 saw an edge-of-the-seat showdown between British Olympians Scott Brash and Ben Maher, as the pair took a one-two against the very best international riders in the world, much to the delight of the packed out grandstands. 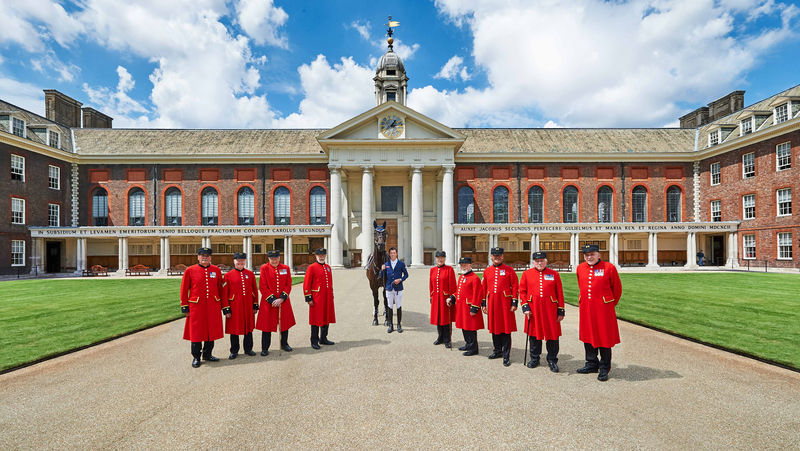 They were joined at the prize giving ceremony by the Chelsea Pensioners, creating a fantastic atmosphere at the historic and unique venue for top level equestrian sport. This year, the GCL team ranking battle could not be more fierce, with the red-coated London Knights currently in the lead. With the innovative and dynamic team competition hitting full throttle as teams compete against the backdrop of the iconic Royal Hospital Chelsea, the Knights - who include British riders Ben Maher and Emily Moffitt - will be looking for home city support as they fight for valuable points to help qualify them for the all-important GC Prague Play Offs. Longines Global Champions Tour brings together the world's top ranked riders to compete in unique locations around the world including Miami Beach, Paris, Shanghai, Monaco, Berlin and Doha for unprecedented prize money, with a brand new GC Prague Playoffs taking place in December. With a shopping village, refreshment areas, plenty of entertainment and thrilling sporting action packed into three days there will be something for all the family as the LGCT and GCL series raise the temperatures in London - all in the picturesque Chelsea and just a stone's throw from the River Thames. The top horses and riders in the world will be in action on Friday, Saturday and Sunday of the event, with the first round of the GCL London taking place on Friday. Saturday will see the GCL London final and the LGCT Grand Prix of London, and Sunday will see a final day of top sport with a thrilling jump off class to finish. Please note the full schedule and timings will be confirmed soon. Tickets are still availale but they're selling fast - book your place at this very special event via Ticketmaster here. Click here for further information about the show and for a provisional schedule.